If you read my story Salma Butterfly – The House Project you may remember me mentioning my friend Buttons, the Woodland Elf. Buttons and I go back a long way. I have been friends with him since – well, for as long as I can remember. All the way back to when I was a very hungry caterpillar in my early days. You see, Buttons and his clan live in the forests that surround Forest Glen, where I live. We grew up together, playing hide and seek in there. We have stayed good friends ever since. When he left on his Very Important Mission he was only allowed to say that he had to go away for a while to do something very important. And that he would tell me all about it later. Buttons came back from his Very Important Mission in time to come to my celebration party when my house was finished. It was there that he whispered to me that his story was ready to be told. And asked me to write this introduction. So without further ado, it gives me great pleasure to introduce this fascinating story to you. I hope you enjoy it as much as I did. “Find this one, I will,” muttered the little Woodland Elf. 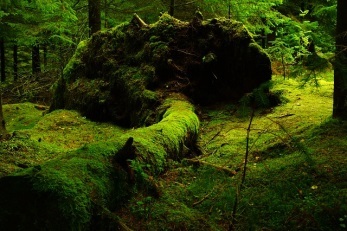 He was standing on the carpet of moss underneath the Magick Old Man Oak. The moss was thick and spongy. Dewy still from the crisp early morning air it served well to clean his feet. Barefoot, he had been tramping through the mud to get to just this very spot. Now here at last, he was able to concentrate on the job at hand. Little more than two inches tall (in human measurement), he was clothed in the style adopted by the Elf People. On his head he wore a soft knitted cap. His simple tunic was also knitted in the same style. It hung loosely around his small frame. On his feet he usually wore pointy shoes made of birch bark. A knotted wooden staff and a rucksack slung over his shoulder completed his rustic outfit. §ĦƪʭΨϿѬѬԓᶘῼ₰ (Button Nose in human language, “Buttons” for short) was five hundred years old in Elf Years (10 human years) . A mere babe, he was just old enough to be allowed to venture out on his own. In his rucksack was a list of items he had been asked to collect. It included directions on where to find each item. Right here, under the Magick Old Man Oak he was to find the first one. Old Man Oak, Buttons knew, would help him to clear his mind and focus on the task at hand. Although the directions led him to the right place, they did not tell him exactly where in that right place the item was to be found. That information was secret, never to be written down or spoken out loud. The clues were hidden in the instructions. Buttons had six sets of instructions listing items he was to collect. They were to be collected in that very same order. That last had been very firmly stressed by the Elf King. Should he not follow these instructions to the letter, there would be no Magick. That would be bad. Buttons had been specially chosen for this Very Important Mission because of his skills. And because he was destined to be The Chosen One. Also, he just happened to be good with solving puzzles and finding things that had been hidden. Skills that would come in handy, he was told. He was warned to make sure he kept his wits about him. There would be dangers ahead. The Elf Master of Woodland Survival reminded him that he knew everything that was needed to survive The Wilds. As he said this, he handed Buttons a small kit, saying it was only to be opened in the most dire of emergencies. He had often heard tell of The Lost Treasure as he sat and listened to the Old Ones sing their songs. In his mind’s eye he saw pictures as they sang. Now, standing very still, eyes closed, he brought the pictures and the soft tingling feeling they emanated back into his mind. Slowly he began to walk around the Magick Old Man Oak letting his intuition guide his steps. He stopped. Stepped back a little and turned slightly to his right. There! He could feel it under his feet! With thumping heart, on bended knee, he gently began to peel back some of the soft moss. The tingling feeling grew more intense. A little deeper, and there it was, softly glowing. A small round, speckled, moss green stone. Reverently, he picked it up. It was warm and tickled the palm of his hand. Carefully he restored the area to what it had been as he hummed the Song of the Lost Treasure. Keeping a little of the moss, he used it to blanket the stone in a wrapping of birch bark and tucked it safely inside his rucksack. Birch bark was used in Magick ceremony by his people to mark new beginnings. It had a strength and resilience to it that protected and shielded the new in the early stages of growth. Buttons was well pleased with himself. Having left in the wee dark hours of the night, he suddenly realised how hungry he was. Sitting with his back resting against the trunk of the Magick Old Man Oak, he rummaged in his rucksack for the food his mother had packed for him. There was only enough for this one meal. The rest he would need to forage for himself as he travelled. Buttons was used to this and knew what was safe to eat and where to find the foods he liked. He also had learned how to call the creatures of the woodlands to help him should he need it. Savouring the taste of the oat cake made for him and sweetened with honey, Buttons contemplated the next step of his journey. I hope buttons never gets undone. He’s pretty well buttoned up ! A very lyrical story. You don’t disappoint the reader. Thanks Bernadette. I’m relieved Buttons is a worthy follow on from Nanunja. Thanks Jo. Buttons has a lot of adventures coming up.